The No. 2 Stony Brook women’s lacrosse team has been off to a hot start this season, already defeating two nationally ranked opponents in USC and Stanford. After No. 1 Maryland lost to No. 7 UNC a day prior, Stony Brook needed a big performance to possibly secure the No. 1 position in NCAA rankings. Scoring 16 goals in the team’s home opener can do the trick. It will be hard to not give the Seawolves the No. 1 ranking, as the team defeated the No. 20 Denver Pioneers 16-3 at Kenneth P. LaValle Stadium Sunday afternoon. Redshirt-senior and senior attackers Courtney Murphy and Kylie Ohlmiller combined for 10 of Stony Brook’s 16 goals. 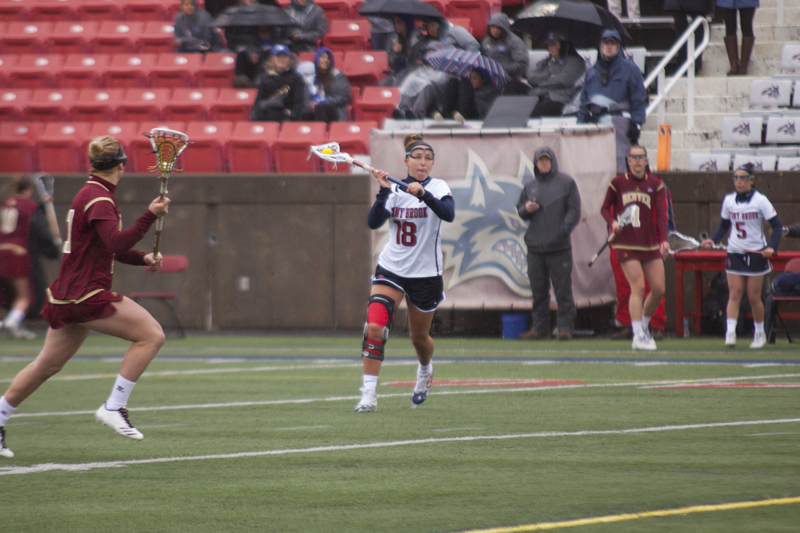 Murphy scored six goals in her return to LaValle Stadium after her ACL injury suffered last season. The redshirt-senior scored four of her six goals during an 8-0 run by Stony Brook that lasted nearly 20 minutes. The Seawolves led 5-2 before the run, and were up 13-2 with just under 15 minutes left in the second half. The defense gave up three goals on the day, including only one goal in the second half. After giving up 10 and nine goals respectively in their first two games, the Seawolves wanted to come out with a dominant defensive display. Stony Brook scored numerous times off free-position opportunities. Denver’s defense was too aggressive at early points in the game, resulting in two quick free position goals from Ohlmiller, who ended the day with four goals and two assists, a total of six points. After a quiet season opener, Ohlmiller has scored 10 goals and recorded three assists, and she inches closer to NCAA records in career points and career assists. The team was able to do its job today, as the team dominated Denver all over the field. Outside of scoring, Stony Brook led in shots, ground balls, clears, saves, draw controls and had fewer turnovers than Denver. National polls come out throughout the day on Monday, and the possible new No. 1 team in the country will be on the road for the next few weeks. First up, a game against No. 13 Northwestern on Saturday, March 3 at 12 p.m.